MIAMI, FL--(Marketwired - April 25, 2017) - ProSolus, Inc. ("ProSolus") is doubling down on its efforts to expand the utilization of transdermal drug delivery technologies. Today Mission Pharmacal Company ("Mission") and ProSolus announced the expanded manufacturing capabilities of ProSolus and an increased emphasis on the company's overall commercialization efforts. ProSolus, a wholly owned subsidiary of Mission, offers unrivaled expertise in the custom development and manufacturing of sophisticated and convenient transdermal and trans-mucosal drug delivery products to treat a variety of health conditions. Acquired by Mission in 2015 and headquartered in Miami, Fla., ProSolus recently expanded its state-of-the-art commercial manufacturing capabilities by installing a second transdermal production facility as part of Mission's Boerne, Texas, manufacturing location. 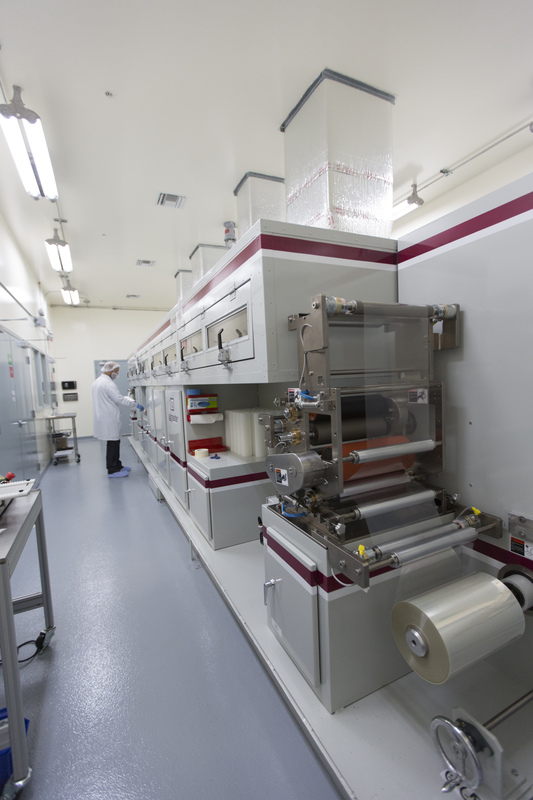 While both ProSolus facilities will continue manufacturing transdermal products, the Boerne location houses a larger production line than the Miami site, more than doubling the company's total transdermal product output. Combined, the capacity of the two locations is now more than 100 million patches annually. Transdermal drug delivery provides patients with a safe and convenient means of taking medications. In a recent New York Times article titled "The Cost of Not Taking your Medications," it was stated that approximately 50 percent of medications for chronic disease are not taken as prescribed. (1) Juan Mantelle, ProSolus Chief Operating Officer and Chief Scientific Officer, and the ProSolus team have developed creative ways to improve transdermal products, often resulting in improved compliance for the patient. Recognized for his innovative and unique approach in this highly specialized area of drug delivery, Mantelle was named to PharmaVOICE magazine's prestigious annual list of the 100 most inspiring people in the life sciences in 2016. "For us, it's all about the convenience and wear-ability of patches -- creating more desirable, smaller sizes that stay in place while working effectively," notes Mantelle. "We are consistently searching for new and better ways to bring transdermal products to market." Transdermals deliver medication through the skin and directly into the bloodstream, avoiding the digestive tract. Patches need to adhere to the skin without irritation, wear well for the duration of treatment, and not lose skin contact to ensure efficacy. When manufactured and administered well, transdermals typically have fewer side effects and provide better therapeutic benefits than other drug delivery options. They also tend to utilize lower doses of active ingredients. Led by industry veteran Jim Self, the new ProSolus commercial team will provide potential partners throughout the pharmaceutical industry direct access to the state-of-the-art research, development, and manufacturing capabilities of ProSolus. Partners can capitalize on the ProSolus team's extensive experience in all phases of product development, from formulation development and regulatory filing to commercial scale manufacturing. They also are adept at developing new NDA and ANDA prescription products, as well as over-the-counter consumer products. Beyond any potential new development projects, ProSolus has an existing portfolio of prescription and consumer assets available for prospective partnership opportunities. A former business development executive at a global pharmaceutical company, Self sees this as a unique opportunity for both ProSolus and its potential clients. "We look forward to increased partnerships with a wide array of pharmaceutical companies looking to commercialize products utilizing leading transdermal patch technology," says Self. "Together we will be able to efficiently develop what are normally considered high-barrier-to-entry solutions and expand the overall transdermal market space, ultimately improving the care and treatment of patients." Prior to acquiring ProSolus, Mission was a ProSolus client. As Mission leadership began to fully understand what Mantelle and the ProSolus team were capable of and how the two organizations shared a vision of delivering exceptional science and skill into customers' hands through innovative and convenient products, the thought of joining ProSolus to the Mission Family of Companies became a reality. "ProSolus enables Mission to offer the latest, highly effective transdermal patches in a wide variety of therapeutic categories," says Terry Herring, Mission President of Commercial Operations. "Now, with the expanded manufacturing capabilities at the site in Boerne, paired with Juan and his team's unparalleled skill in the area of transdermals, our ProSolus commercial team is poised to help us forge new and exciting partnerships that will ultimately benefit patients." For more information about ProSolus, visit prosoluspharma.com, or for direct inquiries about commercialization opportunities, please email info@prosoluspharma.com. ProSolus is a wholly-owned subsidiary of Mission Pharmacal Company. The company offers unrivaled expertise in the development and manufacturing of sophisticated and convenient transdermal and trans-mucosal drug delivery products to treat a variety of health conditions. For more information, please visit prosoluspharma.com. Mission Pharmacal Company is a privately held pharmaceutical company based in San Antonio, Texas. For more than seven decades, the company has been improving the lives of people through every stage of life by identifying unmet healthcare needs. The company delivers innovative, high-quality prescription, over-the-counter, and dietary supplement products using only the purest ingredients and FDA-approved methods of manufacturing. Mission is recognized as a pioneer and leader in the therapeutic areas of women's health and urology and also offers leading products through its pediatric, dermatology, primary care, and long-term care service lines. With the shared objective of improving the health of all moms and babies, Mission is proud to support the March of Dimes Foundation®, the leading nonprofit organization for pregnancy and baby health. Using an innovative business model, Mission has created wholly-owned subsidiaries, BioComp Pharma, Inc., a generic drug marketer; Alamo Pharma Services, Inc., a specialized contract sales organization; ProSolus, Inc., a transdermal drug developer and manufacturer; Espada Dermatology, Inc., a prescription and esthetic dermatology company; as well as BexR Logistix, LLC and their subsidiary company, EPIC Fulfillment, Inc., the logistics and fulfillment arms of Mission, to diversify its offerings and build forward-thinking partnerships with other pharmaceutical and biotech companies. To learn more, please visit missionpharmacal.com.